What does tomorrow’s engineer need to know? What strengths will shape the future? At Duke Engineering, we’re thinking hard about these questions, and preparing creative engineers who are inspired & equipped to solve complex societal problems. At Duke Engineering, we are embarking on an ambitious initiative to transform our undergraduate curriculum. We are crafting a signature educational experience that immerses students in hands-on design, data science, computing, research and entrepreneurship from the very beginning—and engages them in teamwork on real projects with real clients throughout their engineering education. 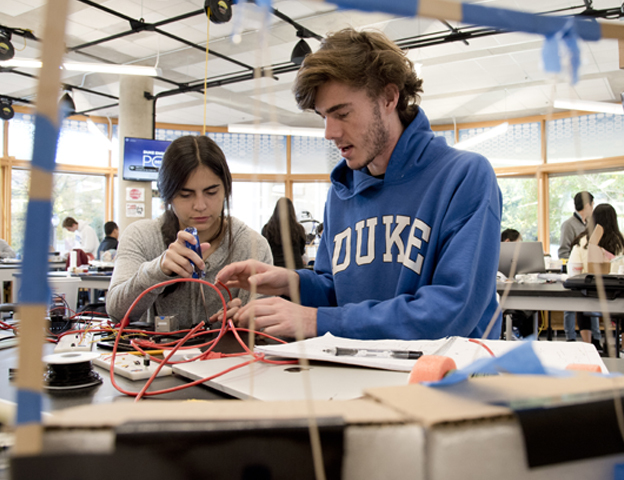 We see these qualities as the hallmarks of a Duke Engineer—complementing the strong interdisciplinary research engagement and educational breadth that Duke University is known for, and preparing our students for high-potential paths in industry, academia, entrepreneurship and public service. I invite you to learn more about our vision for “Inspiring Engineers” in the stories below. Duke Engineering’s undergraduate education space will soon increase by nearly 50 percent, thanks to a new $115 million, 150,000-square-foot building opening in late 2020. Two full floors will support our vision for undergraduate education focused on real-world, team-based, creative problem-solving, with some 35,000 square feet devoted to active-learning classrooms and design spaces; specialized educational centers focused on entrepreneurship and energy, engineering and environment; and a 2,000-square-foot Learning Commons dedicated to nurturing teaching excellence and the student experience. Learn how we have reimagined our students' introduction to statistical analysis. See how Duke Engineering students are solving real-world engineering challenges in our new first-year design experience.